‘It’s coming home, it’s coming home.’ The chants continue to ring out ahead the Semi-finals when we face Croatia. I am totally loving it and find myself suddenly the expert as my voice rings out. My passion for this is something that only appears during the world cup. But what about those who faithfully watch it every week, who are the true experts and may have spent savings or got a loan to go to Russia? And what about those left at home, running businesses unable to leave, watching it down the pub with mates or at home with family? Their shouts drown mine for sure! If it comes home all will hopefully be well. But what if it still comes home for those many women who are silently praying England don’t lose. What if the score really does matter in more ways than one? What if families across the globe are steeling themselves for what could happen if England does lose? There has been a Facebook campaign highlighting the plight of women caught up in domestic abuse and how winning or losing can result in more pain as frustrations are released with fist on flesh. 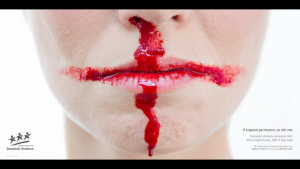 Violence against women increases 26% when England play and 36% when they lose! It is well known that alcohol fuels angry outbursts and severe violence, now combine that with feelings of outrage and disappointment and you have a cocktail for pain. So, my advice is this. Listen out for those cries that are muted. Listen out for cries that have nothing to do with celebration. Listen out for the shouts that are of rage not excitement. Remember this violence is perpetrated across all spectrum’s of society, so no matter where you live it will be happening!